Cuban fricase de pollo, meaning chicken fricassee, used to be one of my go-to meals on lazy Sunday afternoons. It was a recipe that we both enjoyed and was quick and easy to make. I don’t know a Cuban household that doesn’t have a version of this essential Spanish dish. For a while, I toyed with the idea of creating a vegan version of this dish but I couldn’t decide what to use as my mock chicken. I’m a true lover of tofu but I didn’t think that the water-packed extra firm tofu would hold up in a stew-like dish. On one fateful shopping trip, as I perused the vegan options in the produce section of Publix, I discovered the holy grail of all tofus. The tofu gods had heard my prayers and shown me the way to the wonders of pressed, super firm tofu. I didn’t think twice before tossing the small, bouncy package into my cart. I raced home to try this new and mysterious product because I really love new things. Little did I know, it would become one of my favorite vegan foods! So, here, I present to you my vegan version of a quintessential Cuban dish – fricase de pollo. This hearty and delicious Cuban vegan recipe can be served for lunch or dinner. 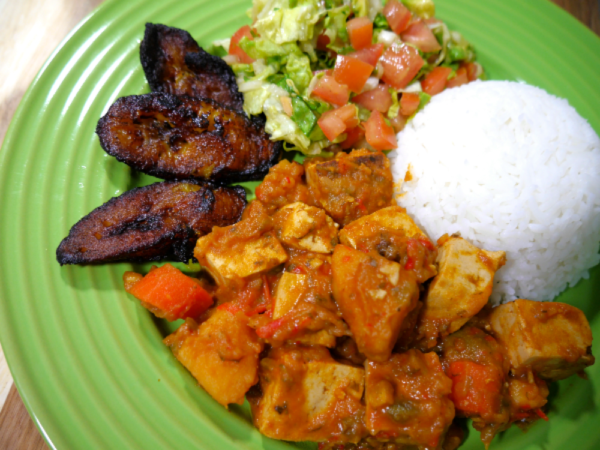 For a more authentically Cuban meal, serve it alongside white rice and sweet plantains. For marinade, combine all ingredients except tofu in a container of your choice. 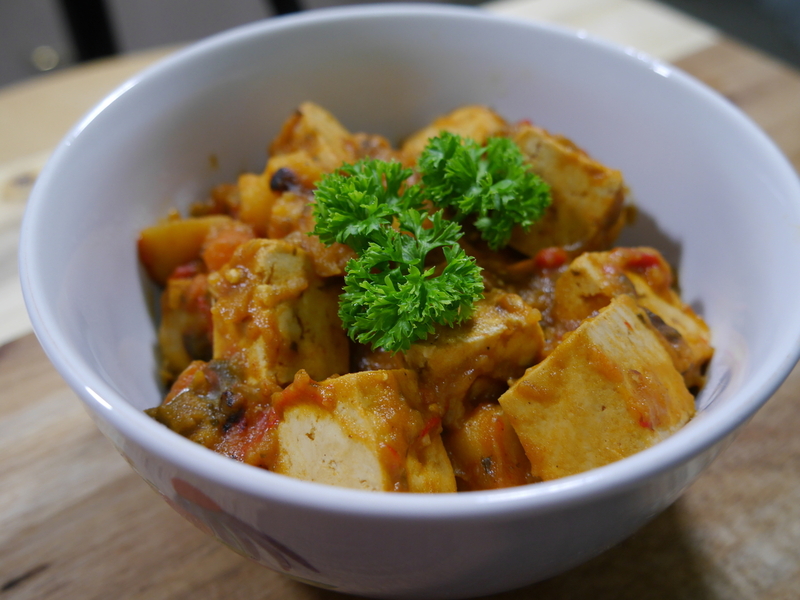 Toss the tofu and marinade mixture in a zip lock bag or container of choice to combine. Let marinade for at least 30 minutes. The longer, the better. Setting pressure cooker to the sear option, add the olive oil, onion, and bell pepper. Saute for about 5 minutes. Once the onion and bell pepper are translucent, add the tomato paste. Then stir in the marinated tofu, broth, Spanish olives, culantro, bay leaf, salt, and diced potato and carrots. Set pressure cooker for 10 minutes. After 10 minutes and once the pressure has been released from the pressure cooker valve, set it on sear again. Cook until the liquid has reduced to desired consistency, stirring occasional to avoid burning. If not using an electric pressure cooker, use pot over medium heat.